Until now, though, halotherapy hasn’t been available in Alabama. But that matter has changed with the opening of Spiro Salt Room and Massage Therapy, in Birmingham’s Mountain Brook community, 2816 Culver Rd. And its owners, Loretta Wendell and Lee Bruno, already have their eyes on expanding the business with salt rooms planned for Greystone and Huntsville. Their new Mountain Brook salt room transformed Wendell’s already existing business, Family Share Massage, into a facility in an area with a high need of respiratory relief. “More than 70 percent of people in Alabama have sinus and allergy issues,” Wendell says. She met Bruno, a client of Family Share, a few years ago. He shared with her the benefits of the salt therapy he’d received from visits to salt spas in Virginia and Georgia, and she was intrigued. A native of Southern California, Wendell began suffering from allergies after she and her family settled in Birmingham 16 years ago. The two joined forces to do research and map out a strategy to bring salt therapy to Birmingham. The result of their effort, Spiro Salt Therapy and Massage, has a Greek sound and look. 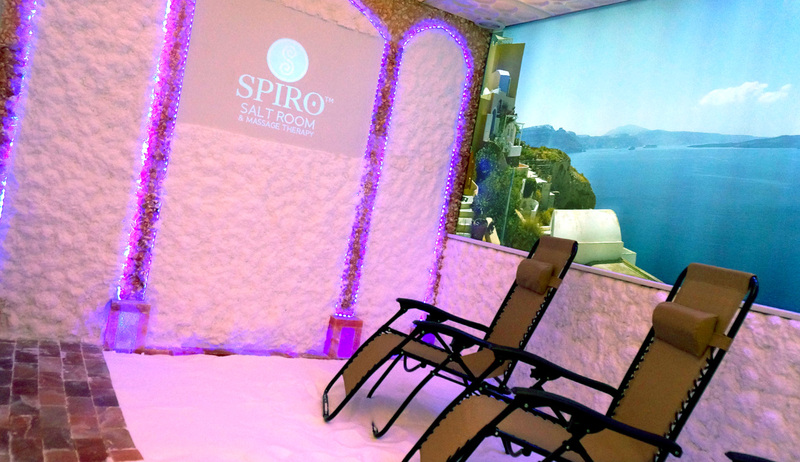 “Spiro is Greek for ‘breathe.’ It not only applies to salt therapy but also to massage therapy, as deep breathing helps clients relax their muscles,” noted Bruno. The salt room, dubbed the Santorini Salt Room, carries the Aegean theme. Murals of a Greek coastal vista cover the upper halves of the walls, with a thick coating of pristine white salt lining the lower halves. Salt room visitors cross the room, on their way to zero-gravity loungers, on a loose salt floor, giving the room a true beach-like vibe. Halotherapy boosts wellness, promotes respiratory hygiene and provides relief for many people – adults and children – with asthma, allergies, bronchitis and other common respiratory disorders. The therapy was developed in Russia and other Eastern European countries, where since the late 19th century people seeking relief from respiratory ailments sought out treatment at the renowned salt mines that dot the region. Beginning in the late 1980s, a young Russian pulmonologist and her husband labored arduously for years to replicate salt mine conditions, and developed a device that could grind salt into microscopic particles and effectively disperse them into a closed chamber with special ventilation. The results of their research on the health benefits of their technology and its development were first debuted in the United States in 1994, at an exhibition of Russian life-science technologies at Virginia Commonwealth University, in Richmond, Va. Prior to the exhibition, VCU life science faculty had reviewed scores of treatments and technologies not known in the West. In the past several years, dry salt therapy has taken hold in the United States, which now has approximately 200 salt room businesses. In Russia, Poland, Ukraine and other places in that region, salt rooms abound and the therapy is prescribed by physicians. In Western Europe, Canada and the United States, it’s a form of complementary care. A Washington D.C.-area company, Halomed North America (halomedna.com), imports the equipment from Lithuania. Above-ground salt therapy is made possible by an electromechanical device that salt room visitors might never see because the equipment is housed outside the salt room, on an adjacent wall. Halogenerators micronize pharmaceutical grade salt and, via a fan, disperses it into the salt room. The only sign that there’s equipment at work is a small sensor mounted on a salt room wall, which continuously measures the level of salt in the air and prompts the halogenerator to either idle or produce more dry salt aerosol, to keep salt room conditions consistent with settings entered at the beginning of each session. Spiro Salt Therapy and Massage is open seven days a week, 9 a.m. to 8 p.m. To make an appointment, call (205) 445-0448 or visit their website, www.spirotherapy.com.